Savage Hart Farm Is A Small Sheep Farm With Guest Accommodations. On the border of Vermont and New Hampshire, Savage Hart Farm is a perfect place to stay for a memorable visit to the heart of New England. 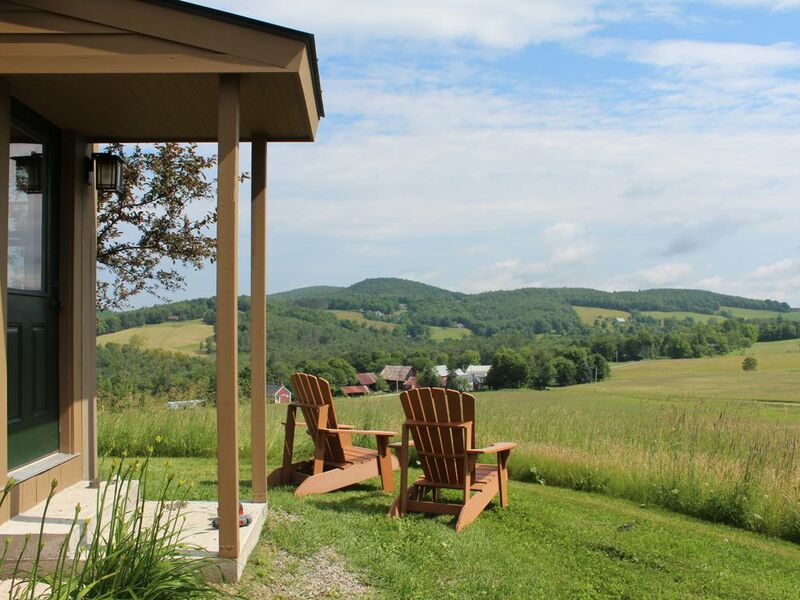 You'll find a retreat-type setting close to the center of the towns of Hanover, NH, and Norwich, VT in a bucolic locale even the locals talk about. Quechee is 15 minutes away; Woodstock 25 minutes. This is ideal lodging for parents, alumni, patients and visitors affiliated with Dartmouth College, Tuck, Thayer, CRREL, and DHMC. Stunning views, modern amenities, Private. Expansive windows. Living area with brand new queen-size sofa sleeper (no springs or bars, very comfortable). Bedroom with Queen-sized bed. Dining area. Well-equipped kitchen. Shower. Maple floors. Washer/dryer. DirecTV. Fully stocked kitchen with oven/range, microwave, ice maker in freezer. Sharing 32 acres of fields and woods with the main house; but only minutes to restaurants and entertainment. Cook in or go out. A two-bedroom, two-bathroom configuration is also available, can sleep six comfortably. Contact us for information. Savage Hart Farm’s owner/operators – Peggy and Todd Allen – share a vision to turn a beautiful post and beam 4-bedroom home on 32 acres into a working farm with a vacation rental apartment. We moved onto the farm in July of 2012, and only a month later we were joined by our “starter” flock consisting mostly of colored Corriedale sheep. By October, we had built a small barn and installed about 4000 feet of permanent fencing to get us through our first winter. With 25 acres of grass, the sheep have plenty of room to grow. Spring 2013 we had five lambs join our flock! And in June, the yarn from their fleece arrived! This is a quintessential Vermont setting with all the modern amenities and just minutes away from several of towns, and dozens of activities and outdoor fun. Full bathroom with shower, sink, toilet as well as washer and dryer. Fully stocked with fluffy towels, soap, laundry detergent and lots of extras. We've stocked the cupboards with salt, pepper, olive oil, coffee, tea and sugar. The kitchen includes oven, stove, microwave, drip coffee maker, toaster, deep sink, dishwasher and fully stocked with dishes and cooking utensils. Dining table seats 4, plus two bar chairs at the kitchen counter so 6 can eat comfortably. My friend and I enjoyed a snowy long weekend here. Beautiful spot and Peggy and Todd were great hosts. We would definitely go back! From the moment you start up the driveway this VRBO lives up to the reviews. You’re greeted by the rams on the left and expansive views of grassy fields on your right. You can find the apartment for a chalkboard welcome sign to the right of the garage door. The unit is quite big, more than enough for myself, my husband and our dog and there is everything you might need, even blankets for time spent vegging on the couch. The views from inside are beautiful, especially in fall when we were there. The Allens are great and their dog Jack is friendly and played with our dog for quite a while (those with a dog will understand how great that is). We were in Vermont to hike but the weather let us down. This VRBO definitely did not! We look forward to hosting you again, with better weather! No matter how beautiful you think this place will be it will exceed every expectation. The setting is beyond anything you could imagine and the apartment is impeccably clean and well appointed with gorgeous views in every direction. The kitchen is fully equipped and easy to use. We should have brought a few groceries and condiments with us on our late evening arrival and then we could have had breakfast in while gazing at the most beautiful views imaginable. We plan on coming back for an extended stay. Thanks for everything. We had a relaxing and fun stay at Savage Hart Farm. Eileen (Peggy’s sister) introduced us to the sheep upon our arrival. Nicely furnished, comfortable apartment. A fun quick family trip. Highly recommend it! We're sorry we didn't get a chance to meet you. You were in good hands with Eileen. Come back again! Our stay at Savage Hart Farm was perfect. We were a group of four friends attending a four day baking class at King Arthur flour in Norwich. While the location was convenient to the school it was truly the hospitality of the owner and the comfort of the apartment that made this stay memorable. The farmhouse sits on top of a hill and has an amazing view over the local countryside. We started each day off with a hike or walk through the surrounding fields and roads. Peggy, the owner went out of her way to share with us locations to hike as well as lend us equipment. The apartment itself was immaculate and had everything that we needed. We decided to stay in one night for dinner and every cooking utensil needed was there and seemed to be brand new. We highly recommend staying at Savage Hart Farm! Dartmouth College, The Appalachian Trail, Billings Farm & Museum, the Rockefeller National Historic Park, the Vermont Institute Nature Center, Norwich Farmers' Market and the Montshire Children's Science Museum. We're also less than 25 minutes away from Woodstock, Vermont. Cancellation Policy: If you need to cancel a confirmed reservation for any reason, no refund of previously paid reservation deposits/prepaid fees will be allowed, unless the Owner can rebook the Apartment for the same reservation period and price. If Owner is so notified of a cancellation, we will make every effort to rebook the Apartment, and will refund your prepaid amounts, based upon any alternative revenue received, less a 10% service fee. Any such refunds will only be made once we actually receive the replacement reservation deposits and/or prepaid rents for your reserved booking period. Security deposits are fully refundable. These rates are for the 1 bedroom apartment configuration. If you are interested in the 2 bedroom configuration, please email us at info@savagehartfarm.com for more information.